In the midst of his semi-regularly scheduled bonkers morning tweet rant, in which he deleted and re-posted tweets multiple times, Donald Trump mixed things up by throwing in an undank meme. Trump’s morning tweets give the world a sense of what he has been stewing over for the past 24 hours. Based on his posts today, it seems he is concerned about Republican congress members causing the debt ceiling “mess” and about the media’s coverage of his recent speeches. 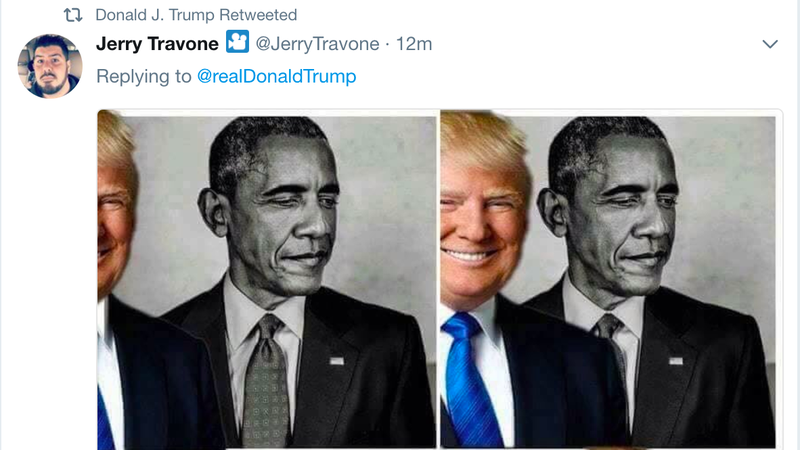 But in the midst of the storm, he threw in a retweet of a meme showing himself eclipsing his predecessor, Barack Obama. It all started with a jab at congress, and the announcement that he had asked Senate Majority Leader Mitch McConnell and Speaker Paul Ryan to tie legislation about raising the debt ceiling into a Veterans Affairs bill. But then he went looking through his mentions for flattering replies he could retweet, as he is wont to. Today, he landed on one by New Jersey-based Trump-supporting “YouTube actor” Jerry Travone. Then, feeling refueled and emboldened by the support of a fervent member of his base, he decided to go after his favorite enemy, the lying Fake News media, for its coverage of his recent speeches. Not pleased with the critical coverage of his oratory skills, Trump decided to review his own speeches. What many saw as a series of disturbing unhinged rants, he saw as “enthusiastic, dynamic and fun.” He immediately deleted those tweets, possibly because both tweets (saved below) contained embarrassing typos. He then took another stab at re-posting both tweets. But he somehow still left in the second typo (“To” instead of “Too’).